When I began college, I kept checking out creative writing reference books from the library, or else buying them from bookstores—it’s always a pain to discover later on that the book itself is not actually worth what you’ve paid. I’ve read all kinds: from dubious, purely instructional manuals to the philosophical but rather useless at dissecting technique. Some are essay collections, some are written in chapters. And very few of them ever mentioned writing science fiction or fantasy, if at all. Those scarce mentions were either wholly unsatisfying single paragraphs (as if the writing of those two genres could ever be distilled in one paragraph) or else much-too specific books (reading about that many generation starships and dragons can actually put you off from writing them). 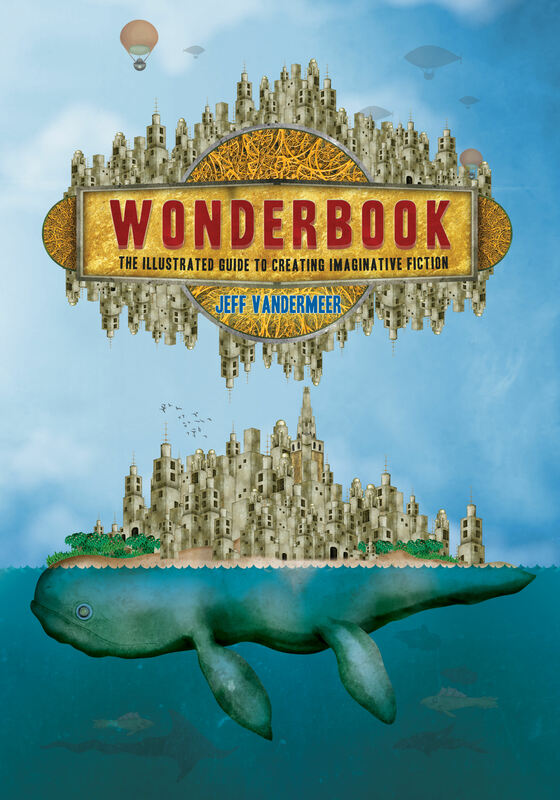 I was beginning to give up on books on writing when I encountered a mention of Jeff VanderMeer’s Wonderbook: The Illustrated Guide to Creating Imaginative Fiction on Chuck Wendig’s blog. Not too long a time later, the awesome Charles Tan dropped a copy in my stunned but willing arms (I am indebted to you. Really). And boy, it does more than deliver on that promise. Jeff VanderMeer’s Wonderbook is both everything I wanted in a book about writing and also everything I didn’t know I wanted. Writing advice streamlined for science fiction and fantasy writers? Check. Nuts and bolts approaches? Check. Interviews and essays with favorite writers on their processes? Check. No artificial mention of publishing and formatting? Check. But brightly-colored graphs on kinds of character arcs? Beautiful cutaway diagrams of marine life that suggest different story structures? A workshop appendix containing LARP and board game approaches to writing? Complicated creative writing prompts and exercises? A website with further anecdotes, essays, exercises, and other supplements that fully embrace contemporary times and alternative learning methods? Oh, my god, GIMME. And if you’re looking for the kind of writing book that imparts a certain type of philosophy, Wonderbook is that kind of book as well, and it’s philosophy, of course, is wonder—only, the wonder is not simply in blocks of texts and how these are worded. It’s in the multitude of pictures, in the humorous ins and outs of the talking penguin and the woman with the gun, in the examples provided by the strange bird Myster Odd (an oddity in himself), in the hugeness and glossy-paged-ness of the entire package. Wonderbook will make you wonder at itself, but it will also gently turn your gaze outward, on the world itself, and the great alchemical mystery of writing and art in general. If you’re a cynic, it might make you take off your gray-hued glasses. If you’re already someone who imbibes wonder in your every day living, you will feel affirmed. Wonderbook, in essence, offers you a new way of looking at things by simply turning something you already know upside-down, inside-out, making lines bolder or softening them at need. The tone of the entire book is by turns humorous and contemplative, but never combative or lecturing—the latter two tones being an irritable hallmark of some of the other creative writing how-to books I’ve read (and like I said, I’ve read a lot). I think I was, all this time, looking for such a book that not only advises that your fiction be open and leave room for reader interpretation, but embodies it in its own text. I can count on one hand the books that marry depth and openness to other genres, other structures, other kinds of everything, and Wonderbook is among these. It’s also a great instructional manual for both amateurs and intermediate creative writers—and I daresay, even professionals will find something new for their perusal here. To be honest, I haven’t even read most of the exercises like I do with other books because I want to be fully-immersed in them, as if I were reading a novel for the first time. Little lessons on the side are indicated by delightfully-drawn help guides such as the aforementioned Myster Odd, the Little Aliens, the Devil’s Advocate, All-Seeing Pen-Eye, and Webinator, according to the needs and nature of such. If these alone don’t stimulate your imagination, then perhaps that muscle needs more than just exercise. But Wonderbook goes beyond all that. It is so much more than that. Only on eBay and obscure bookshops will carry any writing books that talk about writing about the Other (Ursula Le Guin’s The Language of the Night does this as well), that attempt to pin down style and voice and leave you satisfied even though the feat was not actually managed, that acknowledge the connection between elements of TV and the elements of fiction (and which of the former are bad and good for the latter), that discusses how to handle fight scenes, that exude respect for J.R.R. Tolkien’s The Lord of the Rings. If I were to read only one writing book for my entire lifetime, it would be Wonderbook. If I ever become a creative writing professor, I’d teach from this book, as well. It would also be one of the first I’d dive for in my room in case of a fire (knock on wood). Looking back on this review, I’m saddened knowing that I did not do this wonderful book any justice—I’m probably going to slap my forehead later, cursing about something I forgot to add and sneakily adding it later on. But that only means that you should see for itself what magic infuses its pages.